Renew Wisconsin: BIG VICTORY!! PSC Approves $7.7 Million in Renewable Energy Rebates and $10-$20 million in Biogas Spanning 2017 & 2018! BIG VICTORY!! PSC Approves $7.7 Million in Renewable Energy Rebates and $10-$20 million in Biogas Spanning 2017 & 2018! Today, the Public Service Commission of Wisconsin authorized approximately $7.7 million in rebates spanning 2017 and 2018 to spur small, customer-based renewable energy projects throughout Wisconsin. 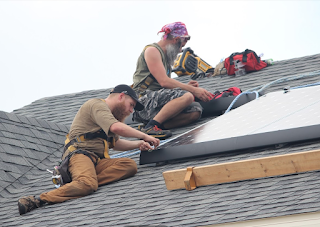 The rebates go to residential, business, and non-profit customers of eligible Wisconsin utilities, and enable the customers to install renewable energy technologies including solar, geothermal, biogas, biomass and small wind systems. The Commission asked Staff to recommend how the renewables funding should be split between residential and business projects, as well as a review of the incentive levels in light of the fact that technology prices for renewable energy systems, specifically solar electric systems, have been dropping very quickly in recent years. RENEW Wisconsin will provide our recommendations, and those of the renewable energy industry, to Commission Staff in the coming days. In addition, the Commission will evaluate spending $10-$20 million to expand biogas production from anaerobic digesters on dairy farms. Staff and program administrators will be developing biogas program options for the Commission to investigate within 30 days, along with program options for increasing Focus on Energy’s energy efficiency and renewable energy impacts in rural Wisconsin. The Commission agreed to lower its cash reserve from $30 million down to $5 million, which freed up dollars carried over from previous years to be put into programs starting in 2017. Huebner said, “We applaud the Commission freeing up millions of dollars of ratepayers’ money from previous years to be put into programs now that will enable energy and dollar savings for customers across Wisconsin. RENEW Wisconsin was the lead advocacy organization promoting the continuation of the renewable energy rebates. We provided two separate memos describing the history and status of the renewable energy industry and its relationship with Focus on Energy and advocating for a continuation of rebates. In addition, a sign-on letter promoting continuation of renewable energy rebates, which was supported by 41 businesses and organizations from throughout Wisconsin, was delivered to the PSC as part of the public comment period in this proceeding. The PSC had authorized a renewable energy loan program in 2014 and allocated $10 million to it over four years. Today, approximately two years into the program, the PSC decided to end the program and spend the remaining funds instead on rebates, which had outperformed the loan program in that two year period. Biogas production through anaerobic digesters will also see a boost. The PSC re-committed to spending $6.4 million on this technology, which it had authorized in 2014. An initial plan to focus on smaller dairy farms was not as effective as envisioned. Today, the PSC authorized the creation of an interagency working group to identify opportunities to expand this technology and its benefits of renewable energy production, water quality improvements, and on-farm revenue stability, and indicated that programs between $10 and $20 million should be investigated to spur this technology. In its comments to the PSC, RENEW pointed out that we have world-class companies working in anaerobic digesters right here in Wisconsin that can help make this program a success.